Back to the (Country Formerly Known as) the USSR! Back to (the country formerly known as) the USSR!! 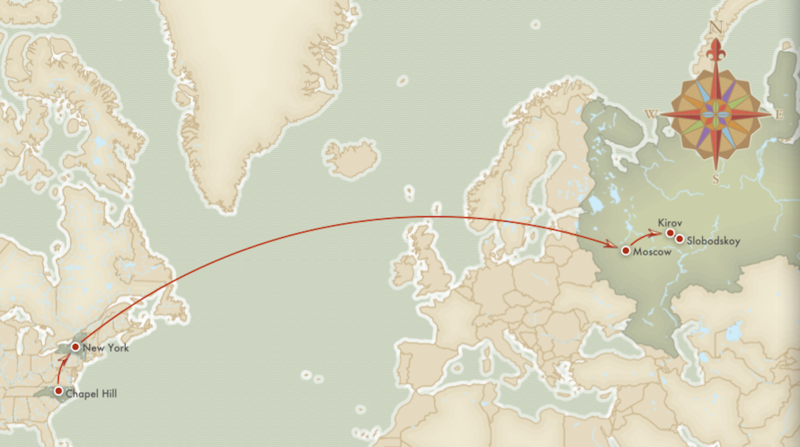 We’re just over 24 hours away from wheels up to Sheremetyevo International Airport (SVO) in Moscow. All the planning, packing and preparation is (almost) behind us – all that’s left is the anticipation and excitement of what awaits us. It’s amazing to think that in just a few days, we will be on the other side of the world – yet we’ll still feel at home, surrounded by neighbors. The journey we are taking certainly has a significant geographic aspect to it. For those who remember our last visit, the flight path looks the same: RDU to JFK to SVO. We land in Moscow on Sunday morning (Russia time – about 2:00 a.m. Eastern time) and have a few hours to visit Red Square, the Kremlin, St. Basil’s Cathedral and a few Russian Orthodox churches. On Sunday evening, we board an overnight train from Moscow to Kirov, covering 14 hours of rural Russian countryside while we sleep. We arrive in Kirov on Monday morning, leaving time for breakfast and a little last-minute supply shopping before boarding our bus for the 60 min+ ride to Slobodskoy. We arrive at the hotel by late morning for a quick shower so that we can get to the orphanage in time for a late lunch. Total travel time = 40 hours. A long journey, for sure…but worth every minute of it. But in addition to the geographical trek we are taking, there is a strong spiritual aspect to our journey as well. In preparation for our trip, the travel team has been reading “A Mile in My Shoes: Cultivating Compassion” by Trevor Hudson. In the book, we have learned about and discussed the three essential ingredients of both an inward and outward pilgrimage: (1) Encounter – encountering both pain and hope in our shattered and fragmented societies, (2) Reflection – thinking about and learning from what is happening within and around us and (3) Transformation – becoming more Christlike in our response to others and in our daily lives. That is our prayer as we embark on this journey – that we will have the appropriate pilgrim attitude among us and that we will learn, receive and listen every step of the way. We will do our best to document the trip in words, pictures and videos so that the entire Mission 1:27 community can share in the encounter, reflection and transformation of this journey. So yes, I think we are ready to go “Back to the USSR” as the Beatles would say. What’s in store for us, only God knows. But bring it on! !